Plymouth State University evolved from Holmes Plymouth Academy, which dates back to 1808 as a pioneer institution for teacher training. As early as 1836, the Reverend Charles Brooks lectured before the Legislature of New Hampshire and throughout the state on the subject of normal schools. An “act for the establishment and management of a state normal school for the better training of teachers” was passed in 1870. The board of trustees located the New Hampshire State Normal School in Plymouth in 1871; the town of Plymouth had offered the Holmes Plymouth Academy and other support to the new school. In 1874, at least 20 years before the system was attempted in any other normal school in the country, the grade and high schools of Plymouth had been organized as training schools under the supervision of the normal school. A new school building (Rounds Hall) and a new dormitory were built in 1890. In 1927, the American Council of Teacher Colleges evaluated Plymouth Normal School and rated it a Grade A teachers college—a rating it has held ever since. 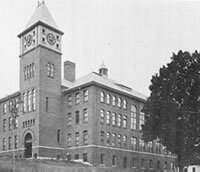 In 1939, New Hampshire’s state Legislature officially recognized the increased stature of the institution by changing its designation to Plymouth Teachers College and, in 1963, to Plymouth State College of the University System of New Hampshire. In 1948, the College offered its first graduate degrees. 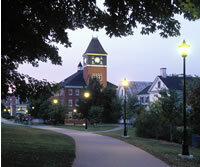 In 2003, the state Legislature changed the institution’s name to Plymouth State University in recognition of the range and depth of its programming. Today, Plymouth State University is a regional comprehensive university offering a rich, student-focused learning environment for undergraduate, graduate, and non-traditional students. PSU offers 52 undergraduate majors and 70 minors. In addition to outstanding programs in education, business, humanities, arts, and the natural and social sciences; centers and institutes for meteorology, the environment, New Hampshire studies, and rural partnerships are hallmark outreach programs.